In the world of hospitality we definitely have you covered. Everyone from your Chef's to your front of house staff...we have a range to suit everyone. From the more casual printed tee's to embroidered tailored shirts, it is more important that ever that your staff are dressed to suit your venue. And what could be easier than outfitting everyone from head to toe with the one supplier? Nothing! So please contact us for more information or an obligation free quote. As an integral part of any restaurant or cafe it is important that your chefs not only look professional but are wearing comfortable and hard wearing uniforms. That is exactly what our range of chef uniforms and chef jackets delivers. Top it off with a chef hat and they will be good to go. We have a quality range of restaurant uniforms suited to a broad range of venues. Tshirts and button through shirts in a broad range of colours and styles, perfect for your logo to be printed or embroidered on them. Buying your restaurant uniforms online has never been this easy. Dress your staff from top to toe. 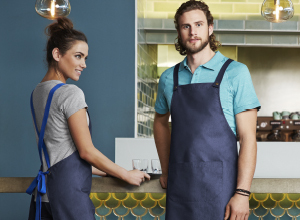 Our range of restaurant aprons, cafe aprons and embroidered aprons will definitely have your staff looking great. Our tunics and shirts will also ensure they are cool and comfortable all day long. Your complete restaurant uniform is ready and waiting for your branding to be added.